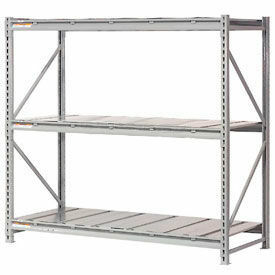 Global Extra High Capacity Metal Bulk Racks Are More Economical Than Standard Pallet Racks. 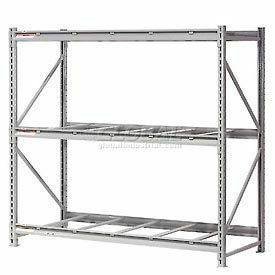 These extra heavy duty bulk storage racks have a Z beam and frame that offers almost twice the capacity per level compared to standard bulk racks. Z-profile beams attach to the upright frame in seconds without the use of tools. Heavy duty 1-3/4"x 1-3/4" x 14 gauge upright steel frames are punched on 2" centers to allow easy level adjustments. Shelf levels include 5/8 thick particleboard decking for shelf support. Formed step beams create superior support for increased capacity. Heavy duty 12 gauge beam connectors have 3 hooks on each end for positive locking. Welded base plates allow floor anchoring for stability. 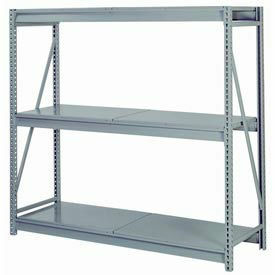 Heavy duty shelving includes a gray scratch resistant powder coat finish. 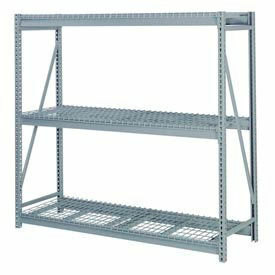 Extra Heavy Duty Metal Bulk Racks With Steel Decking Provide Long Lasting, Rust Resistant Storage. 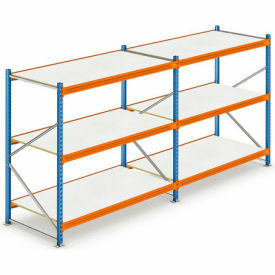 Extra high capacity bulk storage racks are the alternative to pallet rack shelving. Global bulk racks feature a Z beam and frame that allows greater capacities per level than standard bulk racks. Z-profile beams easily attach to upright frame without the use of tools. Heavy duty 14 gauge steel upright frames measure 1-3/4"x 1-3/4". Uprights are punched on 2" centers for easy level adjustments. Shelf levels feature 5/8 thick rib-formed steel decking with rust inhibiting galvanized finish for superior storage that lasts. Heavy duty 12 gauge beam connectors have 3 hooks on each end for positive locking. Formed step beams provide increased capacity and superior shelf support. Welded base plates allow floor anchoring. 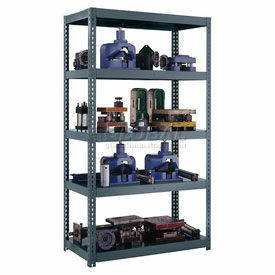 Industrial shelving units have a scratch resistant gray powder coat finish. Global Extra High Capacity Metal Bulk Racks Offer Twice The Capacity Per Level Than Standard Pallet Racks. Extra heavy duty bulk storage racks feature a Z beam and frame that offers higher capacities per level compared to standard bulk racks. Z-profile beams easily attach to the upright frame using 12 gauge beam connectors that have 3 hooks on each end for positive locking. 14 gauge heavy duty 1-3/4"x 1-3/4" steel upright frames allow beam height adjustments at 2" increments. Shelf levels include wire mesh decking for shelf support. Wire decking features an epoxy finish and 3" square openings. Formed step beams and deck supports allow increased capacity. Welded base plates allow floor anchoring for stability. 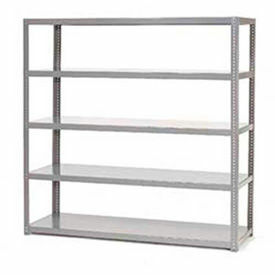 Heavy duty shelving units include a gray scratch resistant powder coat finish. - Made with industrial-strength, welded steel frame and beams for durability. Lyon® Pre-Engineered Bulk Storage Racks Are Designed For Hand-Loading Intermediate Weight Bulky Items In Warehouses And Other Storage Areas. Pre-engineered bulk storage racks are constructed with durable 14-gauge steel uprights for long lasting use. Heavy duty wire decking with welded channels allows air circulation, light penetration, and ensures water flow in the event a sprinkler system is activated. Features front-to-back supports on all levels. Uprights allow shelf beam height adjustments at 1-1/2 " increments. Starter Racks are made complete with all four poles. 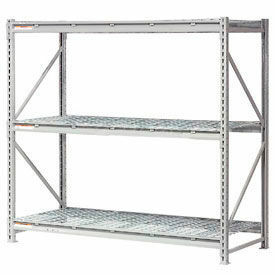 Add-On Racks are made with only two poles for seamless additions to starter racks. Available in 3 Tier or 4 Tier configurations. Color finishes are Blue, Gray, and Putty. Includes Lifetime Limited Warranty. Dimensions vary per model. Lyon® Bulk Storage Racks Are Used For Warehouses, Storage Areas And More. Build your own bulk storage racks by customizing from components in a variety of sizes. Welded Upright Assembly are made using tubular bracing mig-welded to post. K.D. (Knocked Down) Upright Assembly include two posts and two or more bolt-on ladder braces. Available colors are Blue, Gray and Putty. Heavy Duty Beams and Extra Heavy Duty Beams feature a unique Z design to increase strength and load capacity, resist tipping and eliminate wasted space. Beam clips are mig-welded for added strength. Fold-in lock tab easily engages for security against displacement. Beams offer a capacity of up to 3,300 lbs. Low-Profile Beams offer a lightweight high-density alternative for commercial applications. Narrow height design increases vertical storage capacity. Low-profile beams hold up to 665 lbs. Front-To-Back Supports minimize beam rotation under heavy loads. Heavy Duty Wire Decking allows air circulation, light penetration, and ensures water flow in the event a sprinkler system is activated. 4 x 2 wire mesh with heavy gauge welded channels for added strength. Choose from a variety of sizes. Lifetime Limited Warranty. 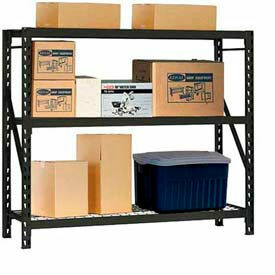 Interlake Bulk Storage Rack Accessories Used For Warehouse Or Residential Storage. 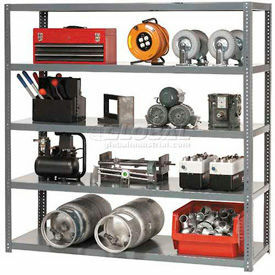 Bulk storage rack accessoires assemble and reconfigure quickly for fast and flexible storage of hand loaded items. Frames are punched on 2" centers for easy beam adjustment to eliminate down aisle growth as well as wasted spaces. Beams are mounted to frame and held in place with two U Safety Pins providing additional security and stability. Drop-In shelf supports reduce beam quantity, accommodating a variety of product sizes, arrangements and steel, wood or particle board decking. 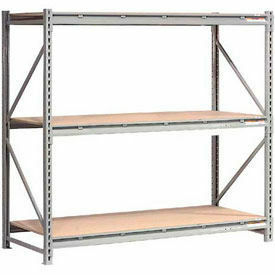 Available styles are Bulk Storage Rack MS Beam, Upright, ZS Beam and Galvanized Metal Shelf. Available colors are Blue, Orange and Galvanized. Dimensions vary per model. *** UP TO 8,489 LBS. CAPACITY PER RACK!